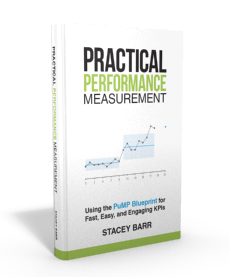 There are many different approaches people take to develop KPIs and performance measures. Does yours have all the parts it needs? Think about the methodologies you use for risk management, product development, policy formulation, training design, recruitment, and whatever else. We have those methodologies because they make doing these things easier, faster, and more likely to work. But so few organisations have a true methodology for KPIs (performance measurement). There are a set of features that methods of a proper KPI methodology have: they are comprehensive, non-prescriptive, necessary, founded, proven, practical, useful and transparent. The features of ‘comprehensive’ and ‘necessary’ are what we’ll zoom in on now. ‘Comprehensive’ means that collectively, all the parts in the KPI methodology assist each step or stage in KPI development, from selection, through implementation, to use. ‘Necessary’ means that each part in the KPI methodology is chosen and designed to replace poor KPI practices that don’t work and eradicate or ease known struggles or challenges with KPIs. Only the parts that are needed are in the KPI methodology, and the KPI methodology has all the parts that are needed. From 20 years or so of global and cross-sector research that’s produced over 13,000 data points, I’m convinced about what the top struggles are that people have with performance measurement. No data or experience has ever contradicted this, from the hundreds of organisations I’ve worked with. People don’t understand the true purpose of performance measurement. Goals are too intangible or difficult to measure. Measures and KPIs are not meaningful and not aligned to strategy. People don’t want to be involved, they won’t buy in to measuring performance. Measures are inconsistent, data is not available or not reliable, and too much time is wasted implementing measures. People can’t agree on what a measure is saying, or whether it’s at target or not. Performance reports are hard to navigate, don’t have useful information, and often not used in decision making. Performance doesn’t really improve, or not enough relative to the cost of change initiatives and improvement effort. If you have a KPI methodology that does not have a framework or technique or step that deliberately deals with each and every one of these eight struggles, you don’t have a proper KPI methodology. Performance measurement shouldn’t be a struggle. It should feel easy, relatively quick, meaningful and engaging. It should generate ownership and excitement for improving performance and reaching targets that matter. It should create a high-performance culture. If your KPI methodology doesn’t deliberately fix the most common KPI struggles, it’s not a proper KPI methodology. 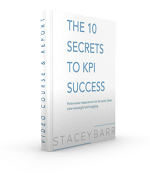 How many of the 8 struggles does your KPI methodology directly fix?